One of the biggest perks of this trans-continental move has been getting closer to family; or at least closer to my in-laws. We are on the correct coast for my family and their air travel time was cut down by three hours, but we are not close enough to allow for frequent visits. Luckily for our Little Man, however, he at least gets to be closer to one set of grandparents… finally. The saddest part, of all of our moves, has been moving farther away from friends that have become family. Living in the American Midwest we were lucky enough to have a couple of visits from family each year. Within the first two weeks of living on the island we had three visits from family, with others planned for the near future. This is my idea of an embarrassment of riches; access to family. Now if we can just get my parents to move a bit farther north… but I digress. The most recent family visit to our little homestead was Dave’s sister. I have been blessed by being a part of multiple families of very strong women, and Dave’s sister is one of them. Because of the distance that used to exist between our respective homes, you could probably count the number of times that I have actually been able to visit her on two hands, and I’m really looking forward to getting to know her even better now that we are so close. When we got a weekend planned for E to come out, we were all very excited and my mind immediately went to what food I could make. I get an inordinate amount of pleasure from cooking for people, and from trying to find the perfect thing or meal to create that fits that person. In E’s case, however, this can be tricky, but to quote her son “tricky, but I can do it.” For various health reasons Dave’s sister follows a unique set of dietary guidelines; not quite vegan, not quite macrobiotic; not quite gluten-free. Her diet is distinct enough that my “go to” ideas of home-made scones and cinnamon rolls did not seem appropriate (though I shamelessly will use those to lure any other family and/or friends to come and stay with us… they’re tasty… you know you want them…). Now before I give anyone the wrong idea, E is also completely “no muss, no fuss.” She does not want anyone to feel they must cater to her eating style, and in fact has been known to bring all of her food with her so as not to cause anyone stress or hassle to feed her. Challenge accepted! For dinner I knew that I wanted to make something out of a macrobiotic-inspired cookbook that E had given me a couple of Christmases ago. The recipe I chose was the Rustic Pasta from Alicia Silverstone’s The Kind Diet: A Simple Guide to Feeling Great, Losing Weight, and Saving the Planet . I have not yet gotten permission from the publisher to post the recipe, and since I did not do anything to make it my own I’ll just have to point you in the right direction for the moment. If/when I get permission to post the recipe I will. In the meantime I can at least tell you that it is a recipe that should not work. It is a simple whole wheat pasta dish with quite a lot of onion and cabbage, and a sauce that combines a little bit of soy sauce with a little bit of marinara sauce. It should not work, but somehow it does. Even Little Man agrees, but I do admit to a liberal dusting of his favorite parmesan on top. I don’t know if I would have been brave enough to try it if E wasn’t coming to visit (motive) and if we had not just harvested a cabbage from the garden (means). Let’s just leave it at the fact that the dish was so good I just made it again for our family for dinner and Little Man scarfed it up again. The recipe I want to highlight for this post is also not my own, but I have gotten permission to share this one with you. Kiersten Frase has an amazing blog called Oh My Veggies – A Vegetarian Food Blog (www.ohmyveggies.com) that I have been truly enjoying. In fact, one of her recipes has become my go-to breakfast. Her Mexican Chocolate Breakfast Shake (click on the text link to go to the site and recipe) takes only minutes to prepare the night before. In the morning simply toss the pre-mixed ingredients in the blender, blitz it up and you are ready to go. 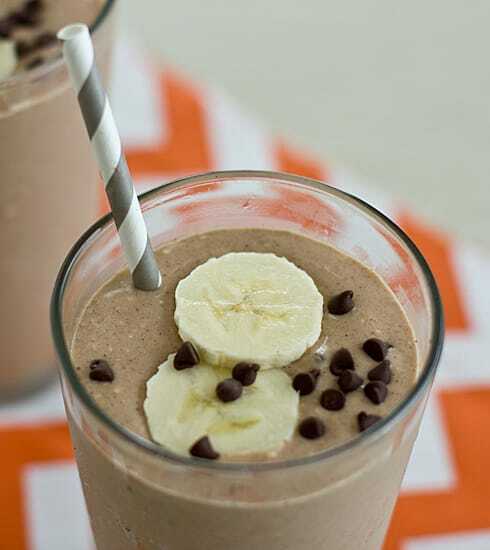 The shakes are creamy, intensely chocolaty and taste like a great milk shake even though they dairy free. The one change to the recipe that I make is blending in two ice cubes per serving just before pouring the shakes. This makes them even frostier, giving more of the ice cream texture. Kiersten also has a Chai Breakfast Smoothie, which we love, and a Piña Colada that I haven’t had a chance to try yet, but chances are it will be delicious. I made Mexican Chocolate Breakfast Shakes for the three of us, Dave, E and myself, and Little Man did his best to smile his way to repeated tastes from all of us. Little monkey! The shakes were the perfect start to our morning. We ended up doing a day trip out to Chemainus, which is about 20 minutes south of Nanaimo. Chemainus is a pretty little town with great character right on the ocean. It is famous for its numerous murals, but Little Man wanted nothing to do with that, and instead pulled us along to the playground by the water. The water was cold but not quite toe-curling, and amazingly clear. Our little guy had a great time wading out with his Dad and looking for shells in the shallows. He also developed quite the crush on his Auntie, or I should say has rekindled the flame. Little Man has only had the chance to spend time with E on two or three trips, and each time he falls for her hard. Good thing the feeling seems to be mutual. This entry was posted in Breakfast, Canada, Chemainus, Recipes, Things to do on Vancouver Island, Vancouver Island and tagged Alicia Silverstone, Beach, Cabbage, Chemainus, Cook, Home, Mexican Chocolate Breakfast Shake, Nanaimo, Oats, Pasta, Recipe, The Kind Diet: A Simple Guide to Feeling Great Losing Weight and Saving the Planet, Vegan Recipe, Vegetarian Recipe on July 24, 2013 by TheSheepAreOut. We love the stories, Marie, and are really looking forward to a visit from all of you. Marie, you know that ANYTHING you cook will lure us with drool dripping off our chins to your new home! Excitedly anticipating our visit next summer! I’m so glad you are getting such precious time with family. It is most definitely a luxury to have family close by (as only those who have lived far from family can deeply appreciate). We’ve tried to talk Mom & Dad into moving northward, too. They won’t listen to us. Maybe they’ll listen to you. Maybe the lure of both sets of grandchildren to the North will become too great to resist. Wow! I certainly feel lucky to be a focus of one of your wonderful stories! What a blessing it is, to finally have you all, just a ferry ride away. I’ll be coming over to challenge you in the kitchen as much as I can. I get an inordinate amount of pleasure from eating your fabulous food!! Deeelicious!! The highlight of my year has been looking forward to having you, Aiden and I guess David too;), being a bigger part of our lives. My big bro married wisely! You can tell my golden haired angel, that the feeling is most definitely mutual! Muah!